What’s under your bed right now? If you’re like most people, chances are good that you have a lot of empty space. You might shove some boxes under there from time to time, but you feel guilty about it because you want to keep your space tidy. Meanwhile, you have a lot of clutter building up around the room, making all the unused space under your bed seem like a real waste. With a queen storage bed, you can take advantage of that space under your bed to store items from your room without guilt. The space saving bed features an enclosed cabinet that hides everything you are storing, ensuring that your room continues to look neat and tidy. 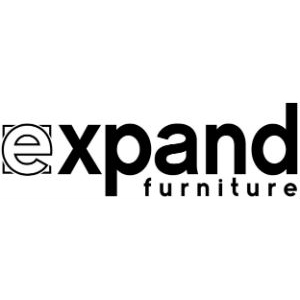 Expand Furniture sells a number of online storage beds to help you find just the right option for your space and your design aesthetic. 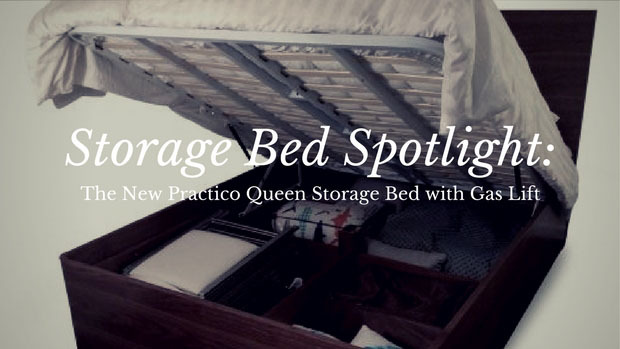 One of our newest offerings is the Practico queen storage bed with gas lift, and it is quickly becoming one of our most popular beds thanks to its many excellent features. When you search for space saving beds, you don’t want just any old sofa bed or trundle bed. You don’t want something that will just get the job done – you also want something that will look good in your home. 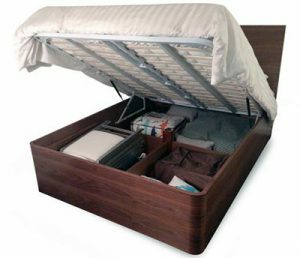 The Practico queen storage bed with gas lift is a gorgeous bed with or without the space saving features. The bed features a modern design with clean lines and a minimalist aesthetic. 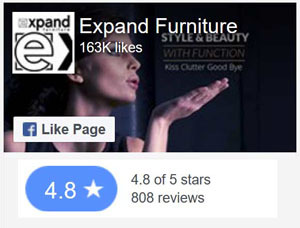 The headboard is beautiful, unblemished stained wood, and the frame features the same beautiful design. It also has rounded edges for a more polished look and to eliminate safety hazards. The walnut finish is perfect for both traditional and contemporary décor schemes. You also have the option to get a white panel finish that is more versatile for modern settings. 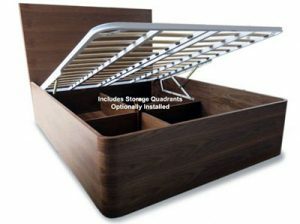 Storage beds are designed to hold goods under the bed, and you access that space by lifting the mattress platform. The lift is designed to be very easy to maneuver. The Practico bed features new technology that makes this access even easier. 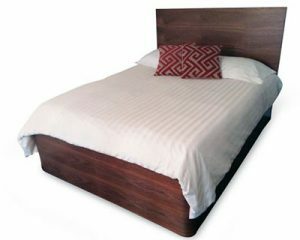 The Portico queen bed has a gas lift that will make it easy for any person to lift or lower the mattress platform. You won’t have to wrangle with a heavy base or wrestle with any sticky hinges. The mattress will lift with the touch of a finger quite easily. The Practico queen storage bed with gas lift has a deeper base than you’ll find on most of these space saving beds. The storage area is 13 inches deep, giving you more room for everything from bed linens to boxes. The storage area is also easily organized thanks to the dividers in the frame. You can easily keep clothes, shoes, and other personal items separated and tidy by choosing the compartment for each. Of course, you can also put your own boxes or bins under the bed to further divide and organize the area. The storage area under the Practico queen storage bed is big enough to hold folding chairs, sporting equipment, and much more. You can stop stuffing your closets to the point of overloading. You can just tuck those items under your bed to keep them out of sight and create more space in your room. You’ll feel more comfortable in the space and will create a more aesthetically pleasing space. 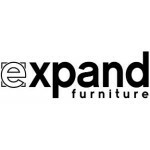 Expand Furniture specializes in space saving furniture, and we sell a number of online storage beds and other space saving beds. You can learn more about the Portico queen storage bed with gas lift on our website, or you can explore our catalog to discover other beautiful space saving beds, transforming tables, expanding chairs, modular storage systems and more. 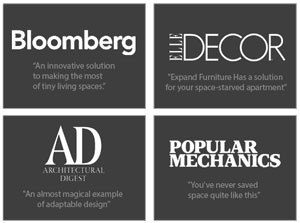 We offer high-quality and beautiful space saving furniture for every room in your home. You can use our furniture to make more space in your smaller home, or you can use it to get better organized and create a more stylish design for any sized home. Contact us today for more information!